Say it ain't so, Rod! Wow! Very cool effect and mix of digital media. Yeah.... 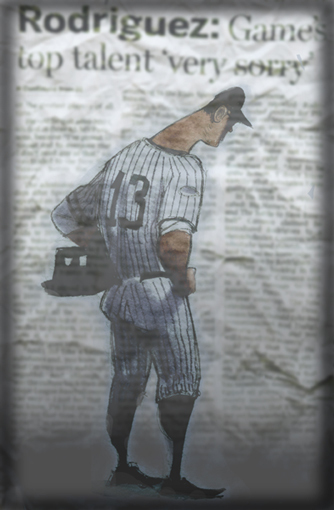 I got a kick out of finding a way to include an actual newspaper heading along with my cartoon style. I'd like to try this again. A-Rod I just rolled my eyes and said...again. But this is really really cool. John: Have you tried to get it out there somewhere as an independent? I suppose everything is contract/syndicated? I don't know, is it possible? How about part of a SI cover? "How about part of a SI cover?" You want to see A-Rod in a bikini? This is what this site does: Throw it out there and see what happens. It turns out that art directors for mags aren't interested in "the new" but the "tried and true". My gig is to keep sluggin' and glory will follow. "Yeah, John, how's that workin' for ya?" "For there is no joy in Mudville. Casey, Mighty Casey, has struck out..."
John: "It turns out that" _____ (fill in the blank) "aren't interested in 'the new' but the 'tried and true'. Too true, across the broad intersection of the Mixed Market and Human Action. Keep pluggin' friend. For those with a "sense of mission," however internally defined, the initial glory is in the righteous doin' of it. IMHO. Just one more in an ever lengthening line of pseudo super heros. I liked baseball when it was simply the man against the game. You know, before every record had a postcript, when atheletes got by on their natural God given talents, and when grafiti was on the walls and not the arms. True, back then a lot of the players smoked, drank and chased women. (At least that hasn't changed. )And after a night of that, they didn't need a shot to be good at their game. They just went out and played the game. Oh, one other thing that has ruined the game is the unions. I became a former fan after the second strike. If you could take a pill that would make you a better artist. . . .
don't lie, of course you would. This page contains a single entry from the blog posted on February 10, 2009 4:09 PM. The next post in this blog is GARDEN WALL.